The county’s leading politicians gathered in Northampton on Friday (July 20) for crunch talks about the future governance of Northamptonshire. The county’s seven MPs, the political leaders of the eight councils and the chief officers met at the Guildhall for high level talks about the unitary system which looks likely to replace the current two-tier governance system. Central government ordered in April that the county scraps its boroughs and county council and brings in a unitary system after the financial failings of Northamptonshire County Council. Then secretary of state for local government Sajid Javid said that only two unitaries would be considered. Since then council leaders and their chief officers have been meeting on a weekly basis to thrash out a joint bid to put to the minister for consideration in six weeks at the end of August. There have been sparse details coming out of these meetings with few council leaders willing to comment publicly on what is being discussed. 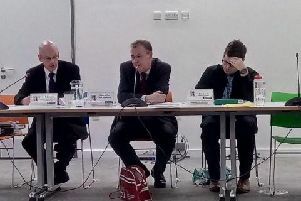 However, following Friday’s meeting leader of Daventry District Council Chris Millar has said although he was not in a position to talk about the exact details, he said the group was looking for a ‘sustainable solution’. He said: “The districts and boroughs have been working positively together on what is the only option on the table, two unitaries. “Whatever the final bid is will be agreed by all parties and then it will be put to the members of the separate councils to vote on. The councillor also said that if a joint bid could not be put together on behalf of all councils then the two commissioners currently overseeing Northamptonshire County Council ‘would take over and do it’. Last week leader of Wellingborough Council Martin Griffiths also confirmed that a growth bid for the county with key asks for jobs and infrastructure was being discussed in the meeting. The eight councils will have a vote on the final proposal just days before it is submitted. Wellingborough Council and Northamptonshire County Council will hold a meeting on Tuesday, August 28, Kettering, Northampton and East Northamptonshire councils will ask their councillors to vote the next day (August 29) and Corby and Daventry councils will make a decision on the Thursday, August 30. A county-wide public consultation about the unitary system which has cost at least £155,000 closed yesterday (July 22) and the results are now being analysed. These results will be fed back to central government. Corby Council is the only authority which has carried out its own separate consultation and contacted every household in the borough for its views. The councils are also paying leading management consultancy PricewaterhouseCoopers to co-ordinate the bid. It is understood that the seven Northamptonshire MPs have not been involved in the decision-making process of the unitary bid but met the leaders and chief executives of the boroughs, district and county council on Friday (July 20) to find out what the current situation is. There are a huge number of issues that will have to be considered ahead of a unitary system coming into place. The billion-pound financial debt level of the county council plus the debts and assets of the seven districts and boroughs will have to be considered. Each council also runs services in different ways, with some outsourcing to private companies and there are a number of shared service between neighbouring councils. There will also be implications for council tax and parish precepts. Some boroughs are also considering setting up a town council with Wellingborough the first to launch a community governance review.